On Wednesday the Times Chief Investigative Reporter, Andrew Norfolk, broke another very embarrassing story concerning Rotherham and it’s turbulent Labour peer! Featuring Lord Ahmed and some of his pretty outrageous views. On this occasion spoken by himself and broadcast on television, last year in Pakistan. Rothpol would be very grateful for some scans from the Times, Wednesday and Thursdays editions, so that anyone who missed them can read the sorry tale for themselves, if any reader could oblige? At Rotherham Politics, we are left scratching our heads at the activities of Lord Ahmed and his apparently limitless ability to cause such offence. We are also continually baffled and dismayed at the failure of the Labour Party to adequately deal with him! This time, there must be no way back for this deeply flawed individual. Oh, the answer to my question? Not by a long chalk! Especially if the labour party continues to stick their heads in the sand and ignore Rotherham’s central problem that Naz Ahmed, Jahangir Akhtar and Mahroof Hussain exemplify! With Sajid Bostan’s words still ringing in my ears, “We’ve fixed the Council, we’ve fixed the Police and we’ve fixed the Advertiser,” we have a lot to put right in our Town. 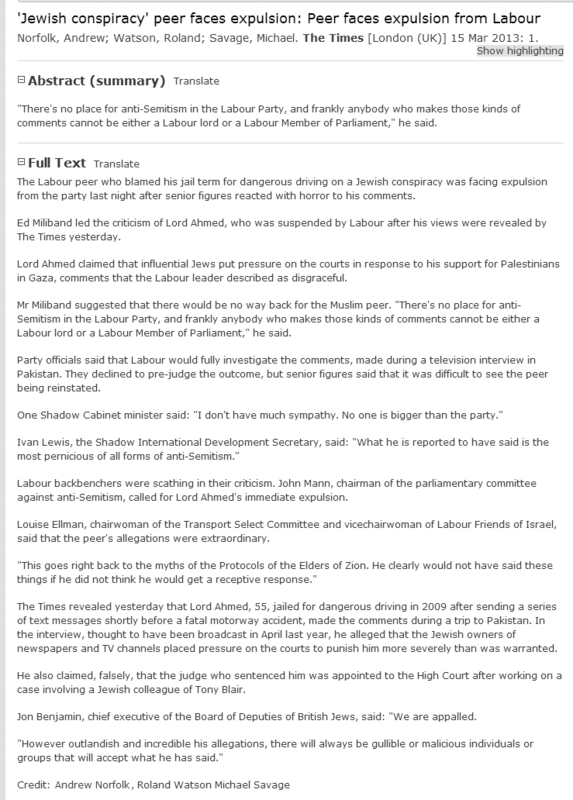 Another take – blaming it on link to MacShane? Was local Rotherham candidate kept off shortlist over MacShane links? With Labour’s controversial selection process for Rotherham culminating in a walk-out by local party members last night, questions have been asked as to why the leading local candidate was excluded from the shortlist after Labour sources claimed they needed “a clean break from the past”. Will Ed Fix It For Moofy? After the shenanigans of the Rotherham CLP candidate selection meeting for a replacement Member of Parliament, even Moofy realised he may have made a tactical blunder. Since things have settled down a bit, we understand that no less than three meetings between Ed Miliband and Moofy Hussain, have taken place. The result, according to Moofy, he will be shoehorned in as a candidate to fight the 2015 General Election. Moofy thinks that Rother Valley would be a suitable berth from which to start a parliamentary career and is said to be focussing his interest there. Why did Moofy get an MBE? A very interesting question indeed! The question, explored on Tales From the Town Hall. We hear, the reason may be have been motivated by more down to earth considerations? PAK Supermarket – What does it sell? Numerous commenters, in both private communications with Rothpol and in comments left on Rotherham Politics, have defended the sole involvement of the PAK Supermarket on the basis that it sold neither cigarettes nor alcohol, without benefit of evidence for their assertions. Rothpol was alerted to the fact that this claim may not be the full truth, by an observant private correspondent, to whom Rothpol is grateful. Just checked and although they do not sell alcohol, they do in fact sell cigarettes and tobacco. So this claim turns out only to be 50% right.